The phrase “The changes and chances of this mortal life…” has always leapt off the page since I was about 9 years old. All of us, since we are limited and cannot just step out of the universe, respond/react to challenge out of whatever matrix governs our life. (No, I am not a relativist. I do believe that we have the ability to “know” the truth. It is just that it must come from outside of us. The truth, if it is to be known, must be received not discovered or grasped [stolen].) That matrix may be based on the truth or delusion. Whichever it is, it serves as the source of our sense of reality and the basis upon which we respond. The journey of spiritual transformation in Christ Jesus is one of dying to the false matrix and being born to the true one (see the movie “Matrix”). We all experience times when we are being pressured so as to move us “off center” or out of our “comfort zone.” Challenge has certainly been (and is) characteristic not only of the life of our family but the life of all of our friends as well. While reading today’s reflection in my newly acquired copy of “Forward Day by Day,” the author quotes the American short story author, Flannery O’Connor. The commentator offered wonderfully practical advice on how to respond to challenge based on Psalm 77. The reflection in its entirety can be found at the link offered above. I highly recommend it. Of course, as with any pithy reflection, it sets me off on a search for more pithy reflections like it in my attempt to drive the point deeper into my soul so it has an opportunity to be integrated into a new matrix of truth (righteousness and life) and dis-integrate the old matrix of delusion (sin and death). God Bless you today as you navigate the challenges of your life. I pray we all will have the courage to embrace them as opportunities for deep transformation – conformity to the likeness of Christ Jesus. I am an inveterate sacramentalist. I look for and expect the provision of grace through the created universe. One thing speaks of and effectively communicates another. One thing appropriately and effectively stands for another. As a child, I enjoyed most, as you can imagine, the parables of Jesus. In this respect, I love music and movies. I love seeing one thing in and through another. I was watching, for the umpteenth time, “The World’s Fastest Indian” recently. Near the beginning of the film, the main character, Burt Munro, played by Anthony Hopkins, responds to the townspeople’s cynical attitude toward his desire to journey to Bonneville to attempt to break the speed record for a motorcycle. He quotes Theodore Roosevelt. I include below not only the complete quote from Roosevelt but a couple of additional quotes that relate to it from one of our country’s greatest Presidents. “One thing speaks of and communicates another thing.” I encourage you to read these quotes as if they were the words of a great Christian elder regarding transformation in Christ and how to pursue it as it relates to the passion of vainglory (people pleasing). I pray this will be a blessing to you. More quotes from Theodore Roosevelt can be found here. Man is the journeyer, the seeker, the searcher, the innovator. It is very good. 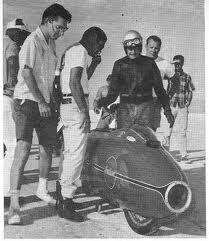 If Burt Munro had listened to his critics he never would have broken the land speed record. 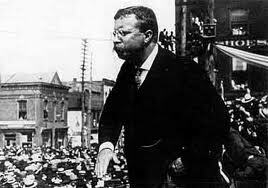 If Theodore Roosevelt had listened to his critics he never would have become the great leader. The truth is essential. None of these extraordinary men rejected the truth. They entertained the truth in a larger context. The context of faith and the human need to transcend his artificial limitations and authentically reach for the stars: “…to boldly go where no man has gone before.” Critics are a dime a dozen. All of us, as disciples, need authentic criticism that comes from people who are willing to go the distance with us and struggle to live in same light of authentic exhortation and encouragement. Every human being seeks to successfully navigate life. As a result, the human being is the great questioner and voyager — the pilgrim. This is, of course, a blessing and a potential curse. Because this is the case, how we question is of the utmost importance. What is the legitimate form that the human journey can take as it progresses? Well, at the heart of this “trek” is the desire to answer many fundamental questions that are not, first and foremost, about what “to do” with one’s self, but who one is. Identity… Let me put forward five of these “identity driven” questions. Why am I here and now? Now, of course, these sound awefully self-centered. They could be just that, and result in the curse and not the blessing. But, once again, it is not enough to ask the questions. It is just as important to do so in a particular way. These questions appear over and over in the Scriptures and the writings of the Church Fathers and Mothers over the last two millenia. These inspired believers used these questions as the basis of their teaching regarding the Christian faith. “Man is created to praise, reverence, and serve God our Lord, and by this means to save his soul. And the other things on the face of the earth are created for man and that they may help him in prosecuting the end for which he is created. From this it follows that man is to use them as much as they help him on to his end, and ought to rid himself of them so far as they hinder him as to it. For this it is necessary to make ourselves indifferent to all created things in all that is allowed to the choice of our free will and is not prohibited to it; so that, on our part, we want not health rather than sickness, riches rather than poverty, honor rather than dishonor, long rather than short life, and so in all the rest; desiring and choosing only what is most conducive for us to the end for which we are created.” The Spiritual Exercises, 23. 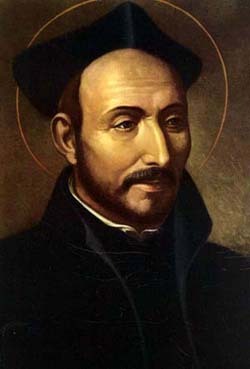 First Principle and Foundation, St. Ignatius of Loyola. God bless your questioning as a means toward deeper blessing and consummate union with Him and others in and through Him.